The five regular polyhedra, or ‘Platonic solids,’ thought by the ancient Greeks to be the shapes of the particles of the five Elements, naturally extend to include the rhombic triacontahedron and the disdyakis triacontahedron. These seven polyhedra are shown to be the 3-dimensional counterpart of the seven stages of development of the 2-dimensional, inner form of the Tree of Life. Constructed from the tetractys, the Pythagorean symbol of holistic systems, the icosahedron, the dodecahedron, the rhombic triacontahedron and — par excellence — the disdyakis triacontahedron are found to embody the (240+240) pattern of non-zero roots of E8×E8, the gauge symmetry group of one of the two types of heterotic superstrings. 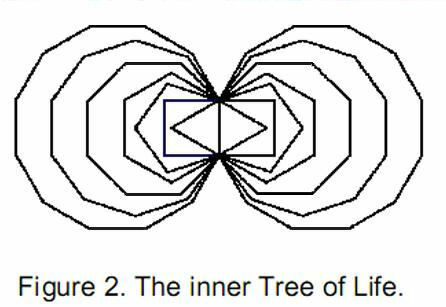 This is encoded in both the inner Tree of Life and the inner form of ten overlapping Trees of Life, which is the representation of the ten dimensions of superstring space-time. 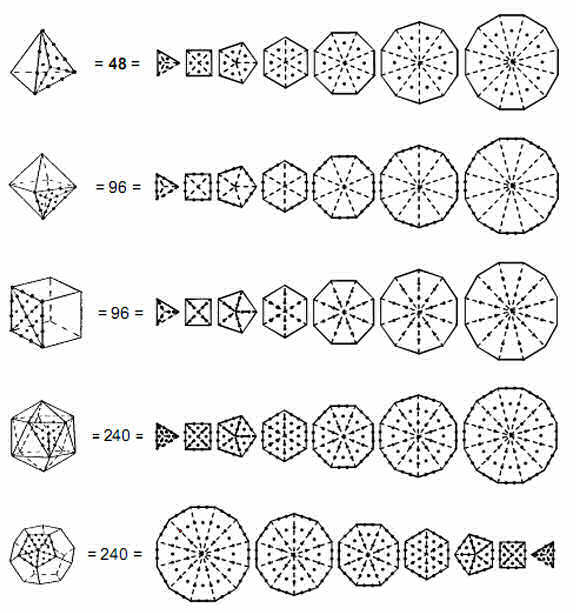 Collectively, the seven polyhedra embody 1680 degrees of freedom that can be interpreted as the 1680 circularly polarised oscillations counted in the basic unit of matter observed with micro-psi vision by the Theosophists Annie Besant and C.W. Leadbeater. The unique significance of the disdyakis triacontahedron, which contains the six other polyhedra, is that it is the complete, 3-dimensional form of the inner Tree of Life. As such, it embodies both the dynamics and the structure of the E8×E8 heterotic superstring. Table 1. The gematria number values of the ten Sephiroth in the four Worlds. (Numbers from this table that appear in the article will be written in boldface ). Figure 1. Equivalence of the tetractys and the Tree of Life. physical and superphysical — embodied as numbers in objects that possess sacred geometry. Triangulating straight-edged objects and transforming their component triangles into tetractyses generates different classes of numbers defined according to the two basic types of dots in the tetractys. Its dots will be called ‘yods,’ named after the name of the tenth letter, י, of the Hebrew alphabet. The yods at the corners of the tetractys mark out the shape of a triangle — the simplest shape, whilst the six yods arranged at the corners of a hexagon and the yod at its centre are generated by the transformation of a triangle into a tetractys. The corner yods just define the triangle and are not generated by its transformation. The seven ‘hexagonal yods’ result or manifest when the triad of yods — the abstract symbol of form — transforms into a pattern that is now ten-fold. It is these hexagonal yods that represent new, formative degrees of freedom implicit in straight-edged objects possessing sacred geometry — new because they play no part in expressing their geometry per se, as this is the function of the yods at the corners of the tetractys. 3. numbers of hexagonal yods. These express formative degrees of freedom with structural or dynamical connotations. the six yods at the corners of the hexagon denote the six Sephiroth of Construction above Malkuth, which is denoted by the yod at the centre of the hexagon. It is important to note that this equivalence means that the yods are not mere mathematical points. They express different aspects of God — spiritual potencies or energies, with the central yod symbolising the outer, physical form of a manifestation of the Divine Life, whether subatomic particle, the human body, the Solar System, etc. As well as its outer form known to students of Kabbalah, the Tree of Life has been shown by the author to have an inner form made up of two identical sets of seven enfolded, regular polygons: triangle, square, pentagon, hexagon, octagon, decagon and dodecagon (Fig. 2). They share a single edge called the ‘root edge,’ so-called because they grow in succession out of it. The two sets of polygons are the mirror image of each other. The root edge extends from Daath to Tiphareth — or rather, their projection onto the plane containing the two sets of polygons, because the outer Tree of Life is three-dimensional and the central Pillar of Equilibrium is not a straight line and does not lie in the plane containing the Pillars of Mercy and Severity. The latter plane is that of the polygons, with Chokmah and Binah coinciding with the uppermost corners of the pair of hexagons, Netzach and Hod coinciding with their lowest corners and Chesed and Geburah coinciding with the outer corners of the two triangles (Fig. 3). The polygonal form of the inner Tree of Life encodes how the outer form replicates itself as the generic template to map all the levels of consciousness that we, as beings ‘made in the image of God,’ have within us, waiting to be attained as we ascend the evolutionary path to the Godhead. As many previous articles have explained and as will be discussed later, this cosmic blueprint also encodes the threedimensional form of the heterotic superstring and its gauge symmetry group E8×E8, where E8 is the largest of the exceptional groups. These structural and dynamical encodings are now discussed. The gauge symmetry group of the E8×E8 heterotic superstring comprises (240+240=480) non-zero roots. Corresponding to each one is a generator of the Lie algebra of E8×E8, associated with which is a non-abelian gauge field whose quanta are messenger particles that transmit the forces between this type of superstring. Figure 4. The five regular polyhedra, or Platonic solids. pentagons. The triangular faces could be converted into tetractyses. However, this would be inconsistent with the division of the square into four tetractyses and the pentagon into five tetractyses. Hence, it must be divided into three tetractyses. and 13 internal yods (12 hexagonal). The pentagon has 31 yods, of which 15 are on its boundary and 16 are internal (15 hexagonal). C – E + F = 2. C = 4, E = 6, F = 4. Number of yods along edges = 16. Number of internal yods = 40. Number of yods on surface = 56. Number of hexagonal yods = 48. 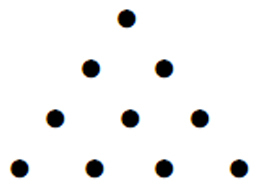 Number of corners of 12 tetractyses = 8. C = 6, E = 12, F = 8. Number of yods along edges = 30. Number of internal yods = 72. Number of yods on surface = 110. Number of hexagonal yods = 96. Number of corners of 24 tetractyses = 14. C = 8, E = 12, F = 6. Number of yods along edges = 32. Number of internal yods = 78. Number of yods on surface = 110. Number of hexagonal yods = 96. 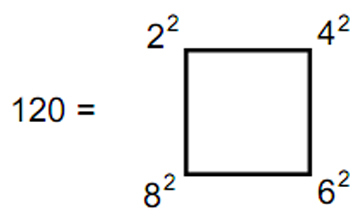 Number of corners of 24 tetractyses = 14. C = 12, E = 30, F = 20. Number of yods along edges = 72. Number of internal yods = 200. Number of yods on surface = 272. Number of hexagonal yods = 240. Number of yods at corners of the 60 tetractyses = 32. C = 20, E = 30, F = 12. Number of yods along edges = 80. Number of yods inside faces = 192. Number of yods on surface of dodecahedron = 272. Number of hexagonal yods = 240. The dodecahedron has the same number of yods (272) and the same number of hexagonal yods (240) as the icosahedron — the latter because they are dual to each other, so that they have the same combined number of corners and faces (32), that is, the same number of corners of tetractyses and therefore the same number of hexagonal yods. 272 is the number value of Cherubim, the Order of Angels assigned to Yesod. Figure 6. The five Platonic solids are the polyhedral counterparts of the four stages of growth of the inner Tree of Life. The fourth solid, the icosahedron, corresponds to its complete pattern of 240 hexagonal yods, and its dual, the dodecahedron, corresponds to the mirror-image set of seven regular polygons with 240 hexagonal yods. tetrahedron, octahedron and cube is also 240.2 This means that the four regular polyhedra, believed by the ancient Greeks to be the shape of the particles of the elements Earth, Water, Air and Fire, embody in their faces the number (480) of spin-1 gauge bosons transmitting the heterotic superstring force that are defined by the non-zero roots of E8×E8. As now explained, this is no accident, because the development of the Platonic solids, when constructed from tetractyses, follows precisely the pattern of transformation into tetractyses of the inner, polygonal form of the Tree of Life. Figure 8. The ratio of the longer to the smaller diagonal of the Golden Rhombus is φ , the Golden Ratio. It is enclosed by the Golden Rectangle. symmetry group E8. The pair of identical sets of polygons, one the mirror image of the other, is the Tree of Life counterpart of the direct product of E8 with itself. It indicates that the E8×E8 heterotic superstring is the type of superstring indicated by the Tree of Life blueprint. Each hexagonal yod denotes a spin-1 gauge boson that transmits the superstring force. Figure 9. The 30 Golden Rhombic faces of the rhombic triacontahedron underlying the disdyakis triacontahedron are bases of 30 pyramids with 120 faces. the corners and face centres of either one (32 in number) coincide with yods of the other. The number of yods in the faces of the combined pair of polyhedra = 272 + 272 – 32 = 512. Of these, 32 are corners of tetractyses, leaving 480 hexagonal yods. As expected, this is the number of hexagonal yods in the two separate polyhedra because, when they combine, only corners of tetractyses coincide, not any of their hexagonal yods. assigned to Tiphareth with number value 76 determines the number of yods along their boundaries because 152 is the 76th even integer. As the rhombic triacontahedron also has 152 yods on its 60 edges, this Godname prescribes its shape. icosahedron bent at their middle points. As a vertex lies above each face of the rhombic triacontahedron, whose 32 vertices are corners of triangles, the number of corners of the 120 triangles = 30 + 32 = 62. This is the 31st even integer, showing how the Godname EL with number value 31 assigned to the Sephirah Chesed prescribes the number of corners of the disdyakis triacontahedron. 62 is the number value of Tzadkiel (“Benevolence of God”), the Archangel assigned to Chesed. As the rhombic triacontahedron has 60 edges and 30 faces, the number of edges of the 120 triangles = 60 + 4×30 = 180. Transformed into tetractyses, the number of yods on their edges = 62 + 180×2 = 422. The number of yods at the centres of the 120 tetractyses = 120. The number of yods making up the faces of the disdyakis triacontahedron = 422 + 120 = 542. The number of hexagonal yods in its faces = 542 – 62 = 480. 120 of these are at the centres of tetractyses. These correspond to the lowest Sephirah, Malkuth, leaving 360 hexagonal yods, that is, the yods in 36 tetractyses. The Godname ELOHA with number value 36 therefore determines the number of hexagonal yods corresponding to the six Sephiroth of Construction above Malkuth. As found for the icosahedron and dodecahedron, the disdyakis triacontahedron has 480 hexagonal yods in its 120 faces. They comprise 240 hexagonal yods either on the edges of the rhombic triacontahedron or at the centres of the faces and 240 hexagonal yods on raised edges of the faces (Fig. 10), that is, two distinct sets of 240 hexagonal yods. They symbolize the 240 gauge bosons of E8 and the 240 gauge bosons of the second group E8 in the direct product E8×E8 for the heterotic superstring. The first three members correspond to the corners of a tetractys because the point, line and triangle are the archetypal precursors of three-dimensional form. The disdyakis triacontahedron lies appropriately at the centre of the tetractys (Fig. 11) because the central yod of a tetractys symbolizes Malkuth, the last Sephirah, and this polyhedron embodies properties of the E8×E8 heterotic superstring — the basic unit of physical matter, which is what this Sephirah denotes. 1 + 2 + 3 + 4 + 6 + 8 + 12 + 20 + 32 + 62 = 150. This is the number of yods in 15 tetractyses, where 15 is the number value of YAH, the older version of the Godname assigned to Chokmah. A more spectacular reason will be given shortly. 60 polygons enfolded in the ten Trees of Life. This 240:240 division of corners in ten sets of six enfolded polygons corresponds to the 240 hexagonal yods of each complete set of seven separate polygons (see Fig. 12). independent geometrical degrees of freedom (corners unshared with Sephiroth of trees). They denote the (240+240) non-zero roots of the gauge symmetry group E8×E8 governing the unified interactions of heterotic superstrings. The 3-dimensional, polyhedral realisation of this encoding is the disdyakis triacontahedron with (240+240) hexagonal yods in its 120 triangular faces. Figure 14. Eight corners of the two sets of seven enfolded polygons with 70 corners coincide with Sephiroth of the Tree of Life (although not a Sephirah, Daath must be included because it coincides with Yesod of the next higher, overlapping Tree of Life). 62 corners of the inner Tree of Life are unshared with its outer form. They correspond to the 62 corners of the disdyakis triacontahedron. Figure 15. 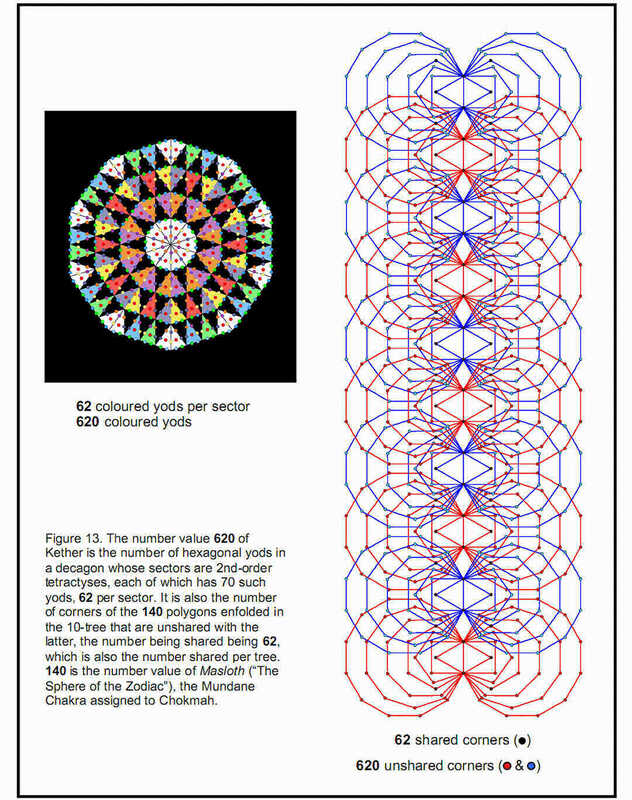 The 120 shape-forming yods on the boundaries of the seven enfolded polygons symbolise the 120 faces of the disdyakis triacontahedron, which manifests the complete pattern of the Tree of Life. 3-dimensional space of these degrees of freedom. 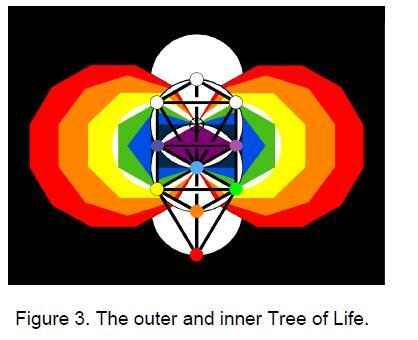 It is the 3-dimensional (polyhedral) counterpart of the 2-dimensional (polygonal) inner form of the Tree of Life. This conclusion is supported by the fact that the shape of the inner form of the Tree of Life — the boundaries of the seven enfolded polygons — is delineated by the 120 yods that lie along their edges (Fig. 15). They symbolise the 120 triangular faces of the disdyakis triacontahedron, which, too, mark out its shape. As the seven enfolded polygons have 264 yods in 47 tetractyses,4 there are (264–120=144) yods inside their boundaries. They symbolise the 144 faces of another polyhedron, to be discussed in Article 23.
that denotes the Divine Qualities manifested by the seven Sephiroth of Construction. The same, seven-fold multiplication was found in Article 20 for the number of cube faces defining the eight corners of the cube at the centre of the 3×3×3 array of cubes symbolised by the 64 hexagrams of the I Ching table: 168 = 7×24, where ‘7’ denotes the number of cubes surrounding a corner of the central cube and 24 = 3×8, where ‘8’ denotes the number of corners of the central cube and ‘3’ is the number of mutually orthogonal cube faces whose intersection generates a corner. 168 is the number value of Cholem Yesodeth, Mundane Chakra of Malkuth (associated with the planet Earth). N(n) = 158n + 100. (Fig. 17). Eight of these yods are in four triangles outside the tenth tree. The Godname ADONAI with number value 65 not only defines the lowest, ten overlapping Trees of Life. 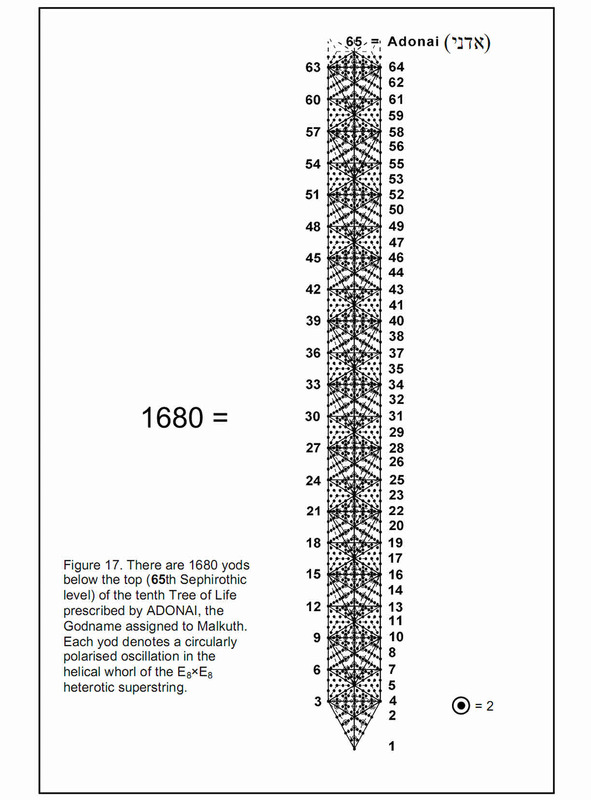 It also prescribes the superstring structural parameter 1680 as the number of yods below the 65th emanation marking the apex of the tenth tree. Any suggestion that this could be merely coincidental is refuted by the fact that the number value of Cholem Yesodeth, the Mundane Chakra of Malkuth, is 168. It is highly implausible that the appearance in the same context of two numbers associated with the most appropriate Sephirah — Malkuth — could be due to chance. T(n) = 12n + 7. 72 82 92 102 . This demonstrates the beautiful, mathematical properties of the Tree of Life basis of the 1680 oscillations made in space by each whorl of the superstring. There are 127 centres of triangles (each the corner of a tetractys) in the ten trees and 65 corners of these triangles. Inspection of Fig. 17 reveals that there is one corner of a tetractys on each side of the central pillar at the level of the apex of the tenth tree. There are (127+65+1+1=194) corners of tetractyses up to this point. 194 is the number value of Tzadekh (“Righteousness”), the Mundane Chakra of Chesed. We saw earlier that the number value 62 of Tzadkiel, the Archangel assigned to Chesed, is the number of the Sephirothic levels of the 10-tree that coincide with corners of the 70 enfolded polygons constituting the inner form of the 10-tree. Therefore, the Godname, Archangel and Mundane Chakra of Chesed have number values that characterize the 10-tree. Once again, this concurrence of numbers associated with the same Sephirah cannot be coincidental but, instead, is a remarkable manifestation of the connection between the geometrical properties of the Tree of Life and the Kabbalistic names of the spiritual hierarchy associated with each Sephirah. *The word ‘element’ is capitalized in order to distinguish its ancient meaning as states of matter from the modern, chemical meaning. lowest five Sephiroth of Construction, starting with the cube, symbolising Earth, the dense physical state of matter, which corresponds to Malkuth. The Elements also represent the five types of awareness (sensory, feeling, thinking/conceptual, intuitive/imaginative and spiritual/holistic) found in Man. They correspond to the five ‘psychic functions’ formulated by Carl Gustav Jung, the great Swiss psychologist. Indian metaphysics also refers to the five tattvas of prithivitattva, apastattva, agnitattva, vayutattva and akashatattva, which are the atomic matters of the lowest five planes of consciousness. Some esoteric traditions add the anupadakatattva and the aditattva, the matter of the Theosophists’ anupadaka and adi planes of consciousness. The author has proved their doctrine of the seven planes of consciousness, which is encoded mathematically in the inner Tree of Life. Each plane or mode of being corresponds to a Sephirah of Construction. The purpose of evolution is to develop and integrate all these levels of being before passing over the Abyss of Daath as a jivamukti, or ‘liberated soul,’ to join the inner Divine Life of the Godhead within Binah, Chokmah and Kether. Fig. 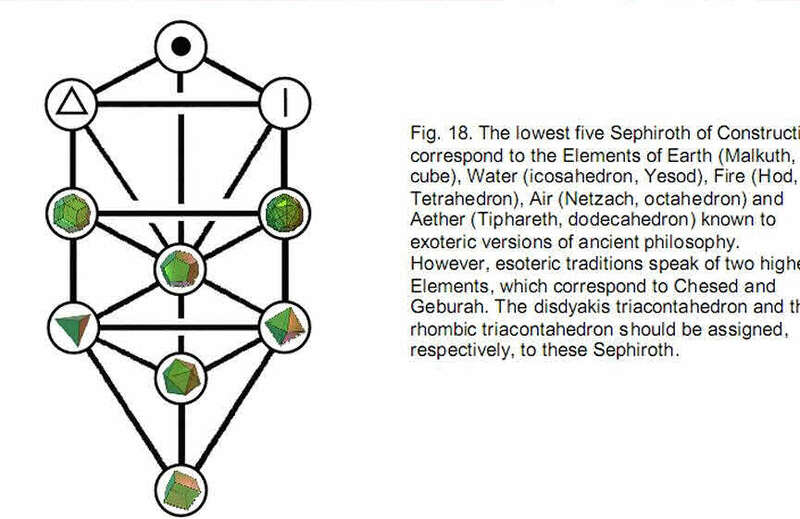 18 depicts the association between the seven polyhedra and the seven Sephiroth of Construction, keeping consistent with both the Kabbalistic association of Elements with these Sephirah and their Platonic association with the regular polyhedra. The dodecahedron is associated with Tiphareth because the Element Aether or Akasha is the fifth most subtle Element and Tiphareth is the fifth Sephirah of Construction, counting from Malkuth. The rhombic triacontahedron is associated with Geburah and the disdyakis triacontahedron with Chesed, the first Sephirah of Construction. The reason for this assignment is intuitively obvious. Just as the Sephiroth of Construction emerge from the first one, Chesed, that is, as the mathematical archetypes become less general and more specific, so all the Platonic solids and the rhombic triacontahedron are present in the disdyakis triacontahedron, whose greatest geometrical generality requires it to correspond to the first Sephirah of Construction. The point corresponds to Kether, the line to Chokmah and the triangle to Binah. the dodecahedron with 12 faces would be fourth in the list whether the numbers increased or decreased, thereby destroying the association between Elements/tattvas and Platonic solids. This must also be incorrect. We are therefore left with only one possible set of correspondences — that shown above. Phillips, Stephen M. Article 3: “The Sacred Geometry of the Platonic Solids,” (WEB, PDF). 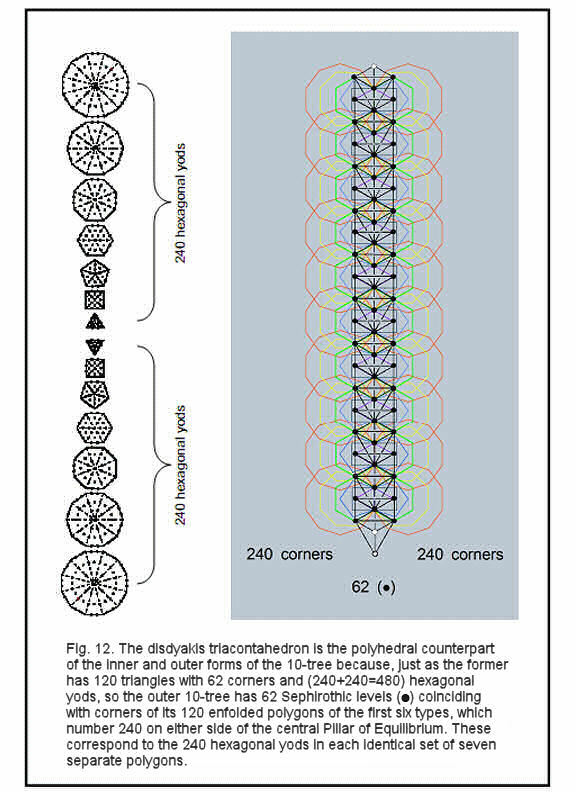 Proof: the tetractys formed by replacing yods of a tetractys with tetractyses has 85 yods.15 of these are corners of the 10 tetractyses and 70 are hexagonal yods. Eight hexagonal yods lie along each side of such a tetractys. Turning the sectors of a regular polygon into tetractyses and then replacing their yods by tetractyses creates (70–8=62) hexagonal yods per sector. A decagon with 10 sides therefore contains (62×10=620) hexagonal yods. Proof: the triangle has 19 yods, the square has 25 yods (21 outside the shared root edge), the pentagon has 31 yods (27 outside the root edge), the hexagon has 37 yods (33 outside the root edge, of which 6 are shared with the triangle, leaving 27 yods), the octagon has49yods (45 outside the root edge), the decagon has 61 yods (57 outside the root edge, of which one — the central yod — is a corner of the pentagon, leaving 56 yods) and the dodecagon has73yods (69 outside the root edge). Number of yods in the seven enfolded polygons = 19 + 21 + 27 + 27 + 45 + 56 + 69 = 264.
sides of 7 triangles up to Tiphareth of the lowest tree. The lowest tree contains 19 triangles with 25 sides, that is, (19–5=12) triangles with (25–9=16) sides outside the area enclosed by the lowest five Sephiroth. Then there are 12 triangles with 16 sides for every higher tree. 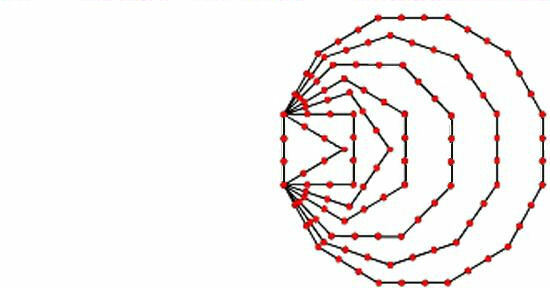 The number of triangles up to the top of the nth tree is 12n + 7. They have (16n+9) sides. Converted into three tetractyses, a triangle contains 19 yods, of which 10 are inside it. Noting that each side of a triangle has two yods between its two ends, the number of yods in the lowest n trees = the number of corners + 2×number of sides + 10×number of triangles = (6n+5) + 2(16n+9) + 10(12n+7) = 158n + 93. Below the top of the nth tree and outside it are 8 yods (4 on each side of the central pillar; see Fig. 16). The number of yods below the top of the nth tree = 158n + 93 – 1 + 8 = 158n + 100. 7. Ref. 2, p. 11.